Ajax has a home! 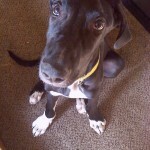 - Rocky Mountain Great Dane Rescue, Inc.
Ajax has a home with Kelly & Steve in Bayfield, CO! This will be the families first Great Dane! Kelly and Steve found out about RMGDRI at one of our Colorado Events this year. Recently they lost their Chocolate lab Roger. While this sweet boy was still alive, one of his best friends was a neighbors Great Dane….Steve and Kelly said to one another that if anything were to ever happen to Roger their next dog will be a Great Dane. Well, that time came and after they visited the RMGDRI event; they filled out an application with a desire for a male black Great Dane….. Ajax fit the bill!!!! We are thrilled for this family. Way to go Ajax!